Rapid-set gelatin that complements even the most challenging fortified gummy formulas. Reduce set time from hours to minutes in easy-to-clean, reliable-dosage starchless systems. 2018 marked Nitta Gelatin's centennial anniversary as a global leader in quality gelatin and collagen production. Providing the highest quality food, pharmaceutical & technical gelatins and collagen peptides that nature has to offer. Staffed with an in-house R&D team, ready to assist with all your product development needs. Offering specialized gelatins for the pharmaceutical and dietary supplement industries. In 2018, Nitta Gelatin celebrated 100 years as a trusted producer of gelatin and collagen products. By continually developing new ways to make the most of nature’s gifts, Nitta Gelatin has consistently played the role of industry leader as a supplier of high quality gelatin and collagen peptides since its inception a century ago. In keeping with our pioneering spirit, Nitta Gelatin continually strives to develop new products, functions and applications for the future. In 2016, Nitta Gelatin welcomed Chicago's Vyse Gelatin into the family, further increasing our product offerings and capabilities. Customer satisfaction is paramount; as is our commitment to exacting quality control, exceptional products, unique processes and environmental responsibility. No matter what your specifications or requirements, you can be confident that Nitta Gelatin and will provide unsurpassed quality and technical service customized to your unique application. April 23, 2019 – In response to the increasing popularity of starchless gummy manufacturing, Nitta Gelatin NA highlights XactSet gelatins, a line of quick-set gelatin, at the 2019 IFT Expo. XactSet gelatins offer superior depositing, and record-breaking setting speeds for fortified gummy applications, including dietary supplements and OTC medications. 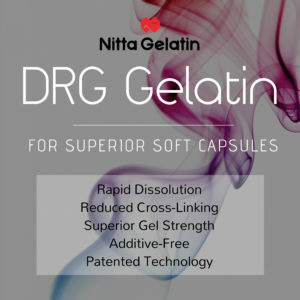 Nitta's North American Application Center can help tailor even challenging gummy formulas for optimal quality and minimal processing time using XactSet gelatin. Copyright © 2019 All Rights Reserved Nitta Gelatin, NA Inc.